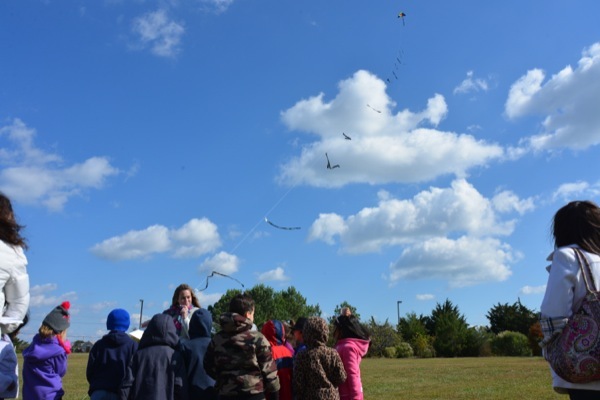 First graders learned about wind, turbines and kites at UD's Hugh R. Sharp Campus in Lewes. 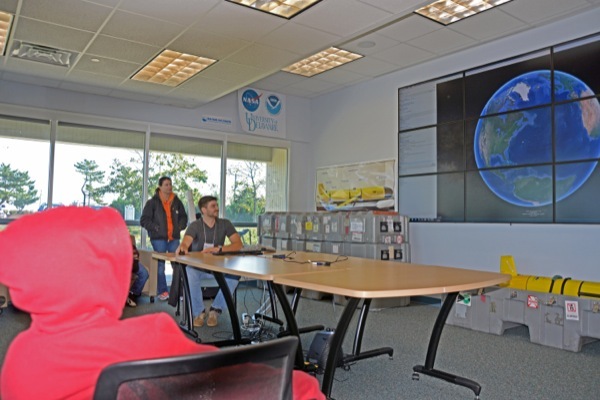 Students learn about satellites and underwater robots at the Global Visualization Lab. Smyrna Elementary students learning about UD’s wind turbine. Students build their own mini kites as part of a field trip about wind. Delaware Sea Grant’s Rebecca Rothweiler discusses wind, kites and clean energy with students. 8:59 a.m., Nov. 12, 2013--First-graders learned about wind turbines during a science unit at Smyrna Elementary School, but seeing one tower 250 feet above the ground at the University of Delaware’s Hugh R. Sharp Campus in Lewes was a whole other experience. McKee and her fellow first-grade teachers brought 100 students to view the turbine recently during a special field trip that complemented their lessons on weather, wind and engineering. The children spent the day making scientific observations about wind, learning about kites and inquiring about the University’s wind turbine. Petrone and McKee developed the program in tandem with a science kit curriculum called “Catching the Wind” by Engineering is Elementary that is used in Delaware schools. Stories and activities in the curriculum involve turbines and harnessing energy from wind. 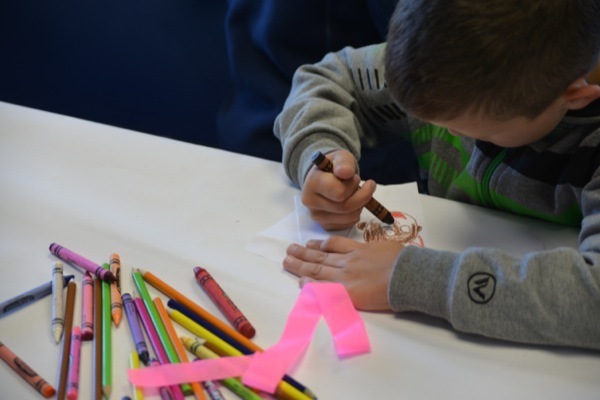 The University’s wind turbine, which helps power the Lewes campus and serves as a research tool, provided a fitting backdrop for the age-appropriate activities and explanations the educators prepared. 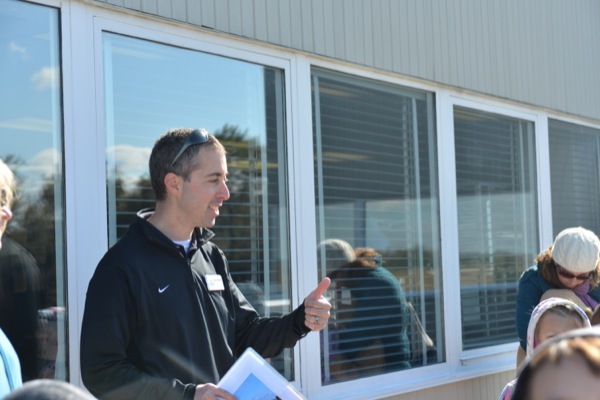 “Since we have a working turbine, we can supplement concepts and activities they’ve done in the classroom with information and experiences they can only get at our site,” Petrone said. Four small groups of students moved around the campus to stop at different stations for 20 minutes each. 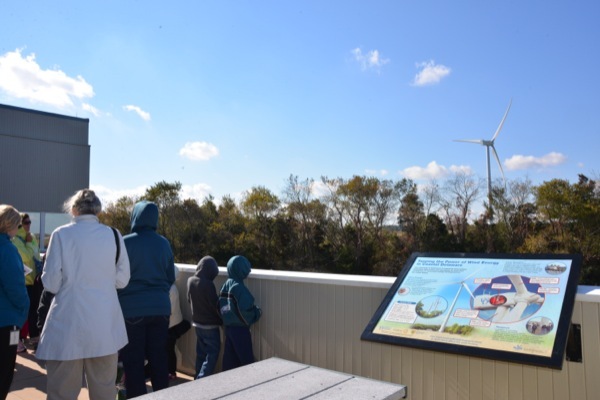 In addition to Petrone’s interactive presentation about the turbine, Delaware Sea Grant Outreach Specialist Rebecca Rothweiler took students into a field to explore the basics of wind science. Rothweiler asked the students to look around to figure out what they might be able to use to determine wind speed and direction, such as trees and flags. Then they used a wind vane, digital anemometer and other tools to measure the wind. The groups launched a kite into the air with streamers attached to the string, demonstrating how wind can be choppy near the ground but steadier at greater heights. At another stop, the students reinforced some of the concepts covered by building their own miniature kites using paper, crayons, tape and straws. The fourth station was the University’s Global Visualization Lab, where a graduate student in UD’s College of Earth, Ocean, and Environment explained how an underwater robot can collect environmental data and transmit the information back via satellites to the laboratory. The field trip started as McKee’s idea to expose children to science and technology in action, but the program fits into Delaware Sea Grant’s broad scope, which includes environmental literacy and renewable energy. Researchers funded by Delaware Sea Grant have also studied technical and socioeconomic aspects of offshore wind farms. Petrone hopes to have more school groups visit in the future or expand outreach presentations in schools as resources become available. The experiences can help spark interest in engineering, alterative energy and other topics, he said. One student, for example, suggested gathering energy from the rain  something that scientists have considered, too. The University of Delaware was designated as the nation’s ninth Sea Grant College in 1976 to promote the wise use, conservation and management of marine and coastal resources through high-quality research, education and outreach activities that benefit the public and the environment. UD’s College of Earth, Ocean, and Environment administers the program, which conducts research in priority areas ranging from seafood safety to coastal hazards.